In last week’s episode of Above Ground on the London Underground we had a look round Knightsbridge. 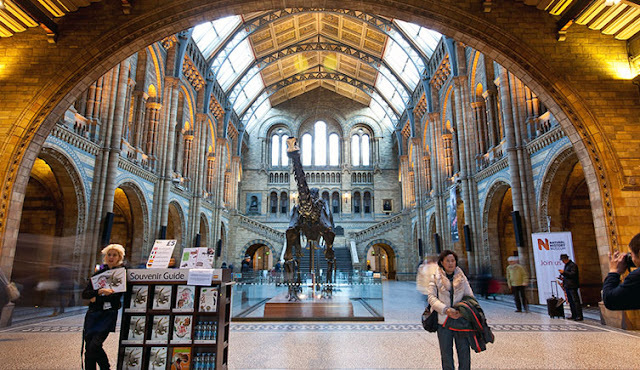 This week, still close to the Piccadilly line, we’ll take a quick 5 minute walk from Stanhope Gardens to Queens Gate Road, up to the Cromwell Road where we’ll find the magnificent-looking Natural History Museum building. 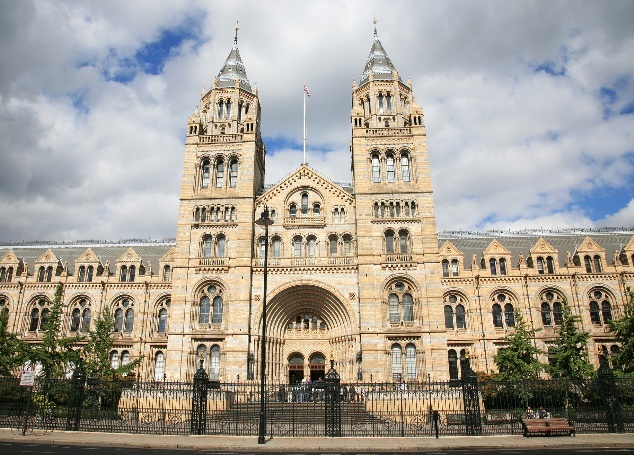 Honestly, I never met a a Natural History Museum I didn’t think was structurally magnificent. They’re designed to be majestic in scope: columns, vaulted ceilings, a multitude of steps, lots of stone and polished marble, mammoth doors, but this one takes the cake. Just as Virginia Woolf deserved a room of her own, so this architecture deserves a post of its own. But not this week. This week there’s been a murder in the museum, and they need our help to solve it. Here’s my confession—which has nothing to do with said murder. Architecture aside, when I get inside a natural history museum—the ones in LA and NYC anyway—it’s usually the dioramas that do it for me. 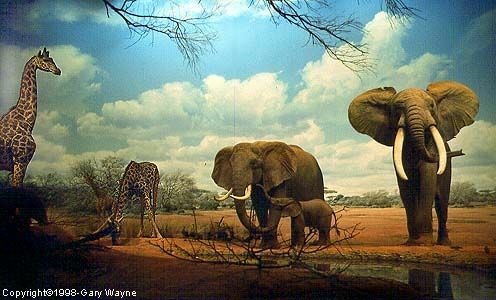 As a kid, I loved creating those shoe box size dioramas we all made in elementary school, these days it’s the full-scale dioramas that museums go in for keep me spellbound. All those stuffed dead animals, the taxidermists’ pride and joy, placed with care amongst the realistic flora and fauna of their home turf. As a child didn’t you always expect the lion to come leaping out of its habitat at you? That’s part of their magic, the wavy line between real and realistic faux. Alas, London’s Natural History Museum, considered one of the finest natural history museums in the world, just doesn’t go in for dioramas. But not to worry, besides solving crime, there is plenty to enthrall. The dinosaurs are positively gargantuan. 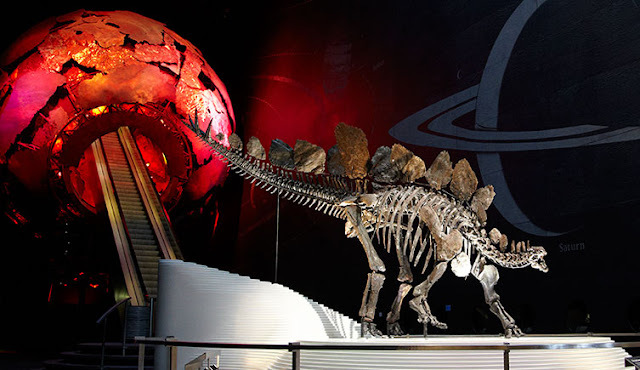 Above is the museum's new Stegosaurus, the most intact Stegosaurus fossil skeleton ever found. In the background, the escalator that takes you through the giant globe into the Earth Hall. There are hundreds of butterflies in their tropical butterfly garden. There are dino-snore sleepovers for little ones and dino-snore sleepovers just for adults with ‘crunchy edible insects’ and an all-night movie marathon. It makes me tired just thinking about it. I once spent the night in LA’s Natural Museum of History when my son was a cub scout, I am definitely out. Trying to get a little shuteye in a sleeping bag on a cold marble floor, surrounded by a hundred restless giggling little boys and grumpy chaperones, just doesn’t cut it. The museum does have something that does. 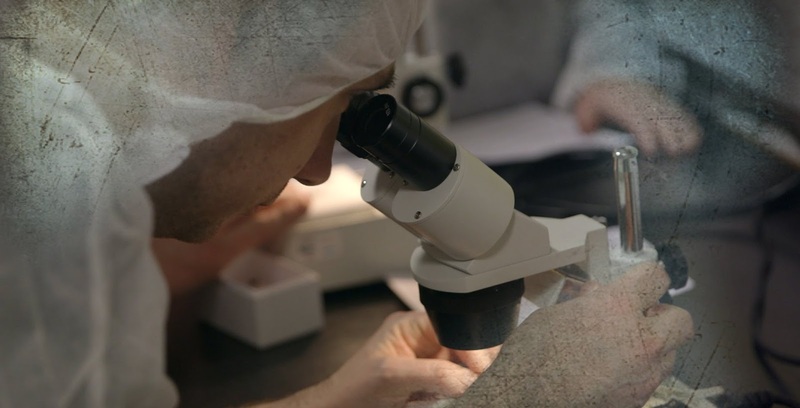 It’s another program just for adults, an evening that will hold particular appeal for adult fans of British crime dramas. 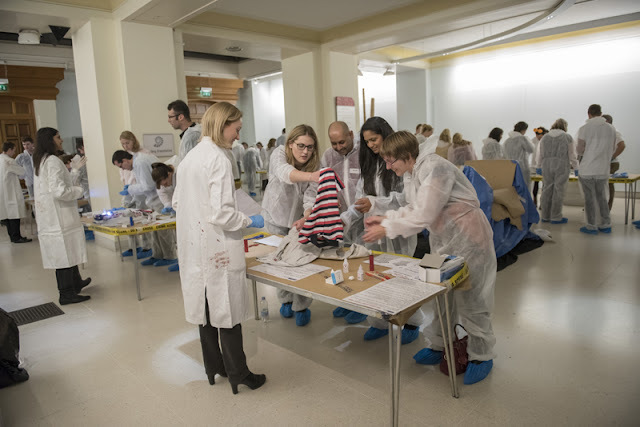 Crime Scene Live is a current monthly offering where visitors are invited to suit up in those white coveralls you’ve seen on every Brit detective show from Scott & Bailey to Luther to work as a crime scene investigator with the museums’ scientists to solve a mystery murder. What a wonderful, nerdy way to spend the night! A bit like those murder mystery party games except you get play around with case files, search through their image database listen to recordings and use fingerprint analysis. 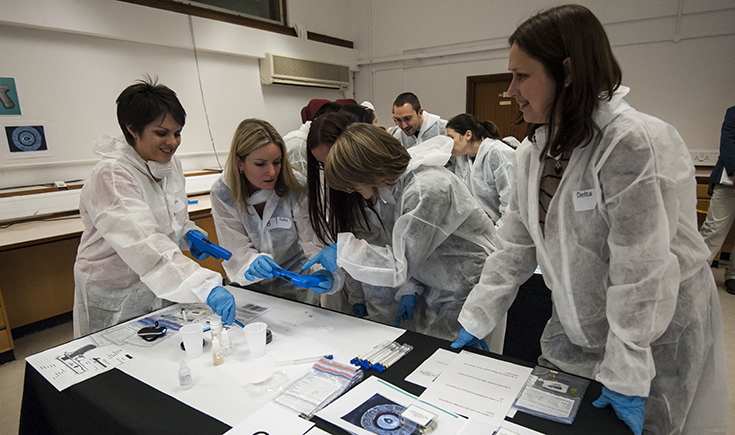 “You will be given crime scene suits to wear for the duration of the event. Please wear cool clothes underneath as these suits can get quite warm. Wear comfortable shoes as you will be walking to the different evidence stations. Please be aware that this event involves some scenes of a gruesome nature. Gruesome? Thankfully they hand out complimentary cocktails before the evening begins. April and May are already sold out, book now for June or July. Booties on, delving into the data like an honest-to-goodness CSI pro? I guess I can live without the dioramas. What do you think? It’s a short one third of a mile to the museum but after all the walking around, I can probably fulfill my daily goal of 10,000 steps, right? Let’s say I did. I am loving your series here. I would love to see this museum. In all the times I've been in London I have not been here. Need to rectify that. Also the second reference to Luther today, need to get Netflix!! Wow! I'm now really wishing that we went to the Natural History Museum when we were so near it in London. It looks fantastic! Oh, and what fun to get there for Crime Scene night. Although, I'm not sure my husband would get as much of a kick out of it -- I need to go with you! Yeah, Laurie, maybe I should have said “fellow grumpy chaperones”, That night was miserable!